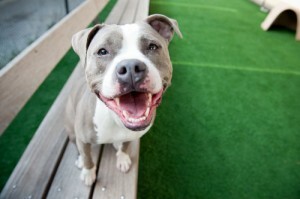 Indigo is a sweetheart of a girl who always has that big pittie smile when you meet her. 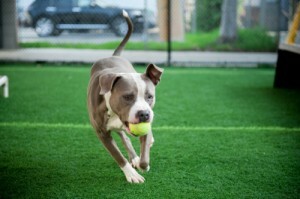 This girl is always is ready for a run, to play fetch and lay in your lap and get all day long belly rubs. Recently she absolutely won my heart when I had her out working in the play yard with me. As she set attentively by she just watched and nuzzled on me and when I was cleaning beds she would lean in and give me a lick on the cheek every now and again. If I didn’t give her enough attention she’d go get the ball and then drop it in front of me and roll over while wearing that big goofy grin. Beautiful pics of this cutie, that last one is the most precious! Indigo is a real sweetheart and one of my favorite TBL dogs too! I love to walk her when I come to TBL because she is always so happy and cheerful. She loves to pull Craig on his skateboard and she is a great little runner, smiling the whole way.